In the heart of the Theater District between 8th and 9th Ave on 46th Street, the restaurant is a celebrated Broadway fixture. A New York institution, Frankie & Johnnie's Steakhouse is the longest running show on Broadway (as well as one of the city's oldest continuously run dining establishments), having opened as a speakeasy in 1926. Join us for Mother's Day, and celebrate with our Mother's Day Special menu! Special $75 Three Course Menu plus a glass of Valdo Rose Sparkling Wine on us! The steak was acceptable but Gallagher's is far better. Too much salt in the creamed spinich and their rare not rare enough. Corn soup was ok but nothing to write home about. The waitors worked hard but the wait for a rare steak was far too long and the girl seating us not very helpful. A place I will never visit again. Frankie and Johnnies is probably the most underrated steak house in NYC. I used to not go there because I thought it was going to be a tourist trap based on the location. Boy was I wrong. The Sirloin is one of the best I’ve ever tasted. The shrimp scampi is awesome. And the people that work there couldn’t be nicer. They also make a great burger. I think it’s only available at the bar. Love this place. Best steak in town and amazing service! High priced steakhouse that is phoning it in. Mediocre food and service. 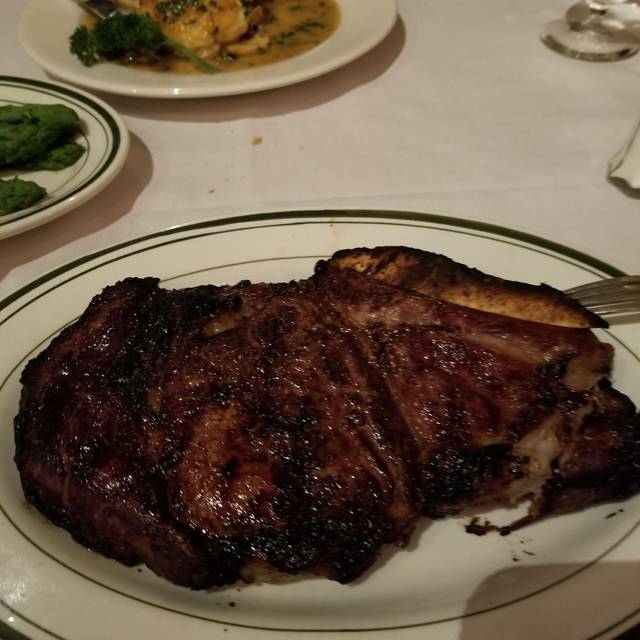 Go to Gallagher’s, Mastros or any one of the many other high steakhouses that actually make the effort to provide a great meal. 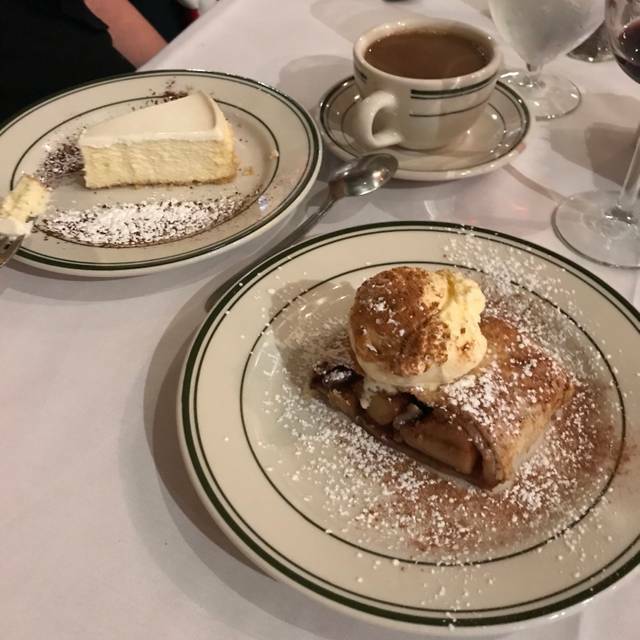 My wife and I had a wonderful night and could not have been better, Everything was perfect, the food, service, price and the place it's self. I must make referance to the guy who took care of us, sorry to say I can't remember his name, but I know he is 49years old the same number of years we have been married, this guy was great and made your night at bit special. The meal was great and the service was exceptional. Will definitely come back again. Steaks and lamb over cooked. Order under what you really want. Pre-theater dining is very easy here as they cater to various curtain times. The special menu of three courses is just right with good choices for a quick meal before a show. Our petite filet mignons were not as tender as we expected but perfectly cooked to medium rare. With a glass of wine apiece the tab came to over $150 which I thought was high. We chose to leave before the dessert course, not their fault at all, so great service and low noise make this a good choice if price is no object. A group of was in town for a broadway show and we went to dinner afterwards.Frankie and Johnnies was perfectly located to the theater, we walked. We were an hour early and were seated without hesitation or a wait. Our server was Margaret, she was a joy and helpful with drink and dinner selections. It’s always comforting when the server knows the menu and is capable of making suggestions to fit your desires. The food was delicious and everyone in the group loved their dish. The lamb was amazing, steak was so tasty no need for steak sauce. The food was well worth the money spent and all say they would return when visiting NYC. Excellent service, food was good...not great as one would hope for the steep price! Great steak, appetizer "bacon" was awesome but way too much food. Great location for before Broadway. Service was outstanding. I'd go back but order way less! It was simply a great night out with the wife from start to finish. The apps, entrees and desserts were delicious only to be accompanied by fantastic service. Two thumbs up. Dish too small for meat size. It was my birthday. There was no delicacy to me, and I put note on the reservation. I am Brazilian and I’d hope more from New York. If you want a good steak that'll blow your mind, come here. Yes, it is expensive, but it's worth it. 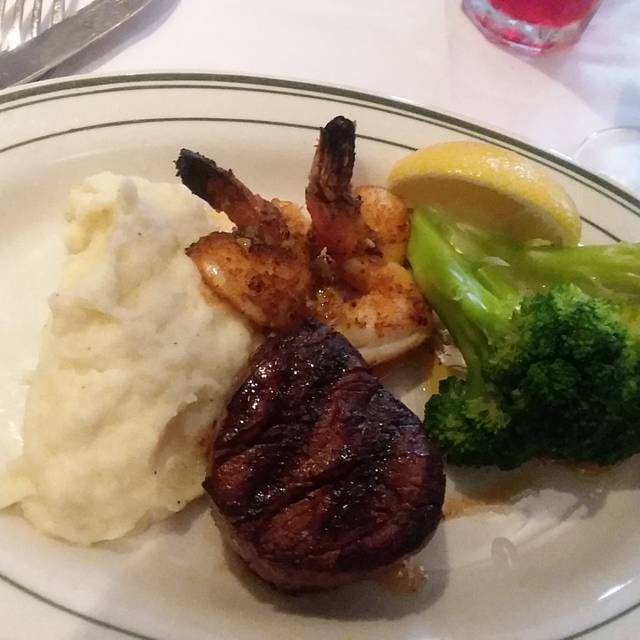 The filet mignon was my favorite and cooked to perfection. The potatoes au gratin and Cesar salad were really good too. The waiters are always quick to bring the food, get you seated, bring you drinks etc. 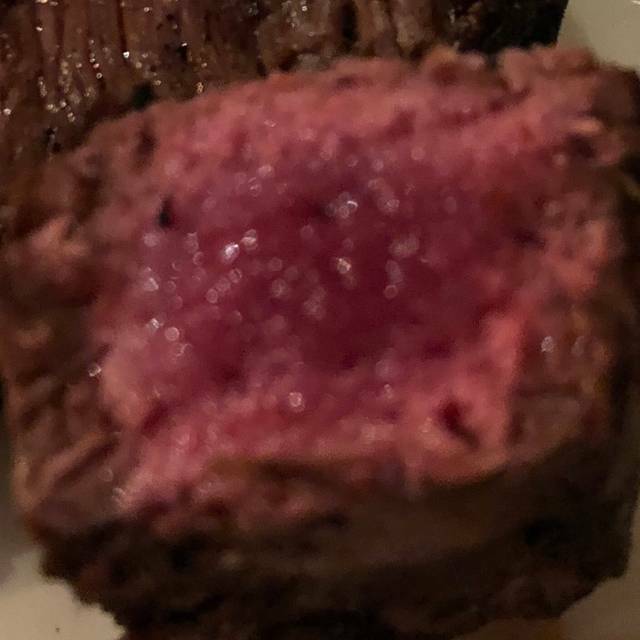 I asked for my steak medium rare and it was brought that way. Would recommend this place, it's one of the best! Reserved a table for 5:15pm, was seated next to the kitchen and bathroom entrance and the place was relatively quiet. Had to demand better seating. The service was slow between courses. 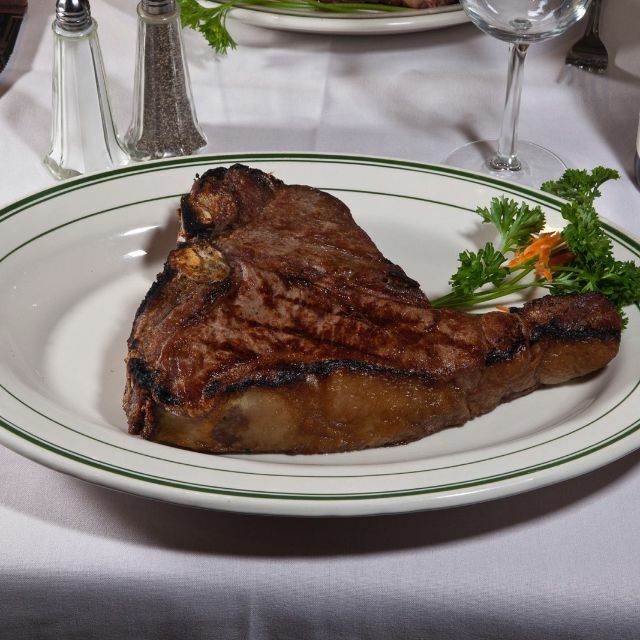 Porterhouse foe two. Good, not great. Honestly the best steak in NYC at Frankie & Johnnie’s, everything was lovely, the hostess sat us down at a beautiful table and the service was excellent. We had a wonderful time, will come back again. The food and service were on par as expected as were the cocktails and wine service. They accommodated our group with a larger table in a quieter part of the dining room per our request. Loved this place! My husband still hasn’t stopped talking about how the calves liver was melt in your mouth - the best he had ever had. My daughter and I shared the ribeye. It was fantastic! We LOVED the Au Gratin potatoes! Definitely will be back. What a wonderful find! Staying in Midtown Manhattan, we came across this restaurant while wandering around. Great service, perfectly done steak and very attention service in a very relaxed atmosphere! We arrived 45 mins early for our reservation and were seated immediately. Our server was hilarious and didn’t rush us at all, many couples came and went around us. We thoroughly enjoyed our dinner and conversation at Frankie & Johnnie’s. Will be back! One of the best steaks I have ever had! Can't wait to go back! The food was excellent the service even better. I recommend this restaurant. They have a special theater menu. Good value for the price. 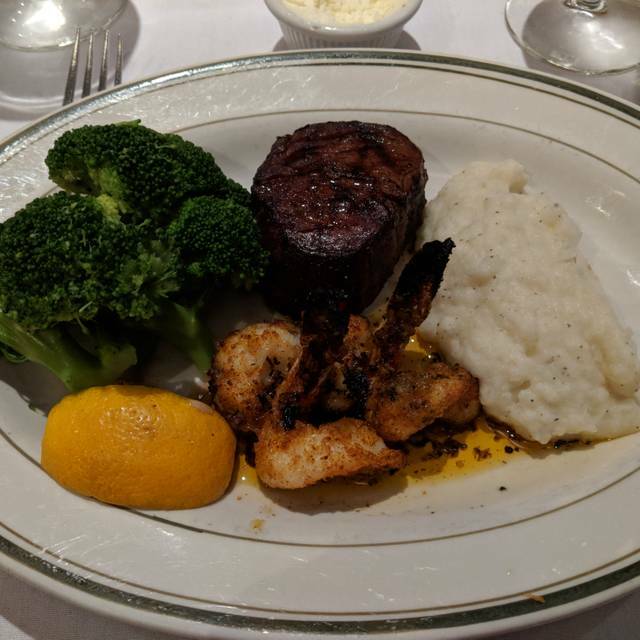 Went to Frankie and Johnnie's Steakhouse for the first time during NYC 2019 winter restaurant week. The restaurant week meal serving size is the largest of all restaurants I have been at so far. 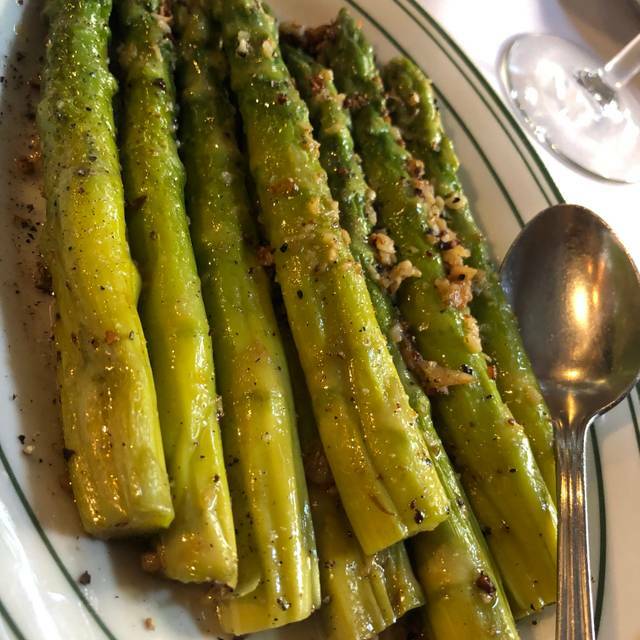 They also have a $30 lunch menu where you get the same amount of food and similar choices This is a GREAT place to go during an extended lunch hour or after work for a delicious meal and some wine or beer. The best thing about this steakhouse is that you do NOT have to dress fancy at all; it has a real neighborhood homey feel on the inside. The food is amazing and delicious. 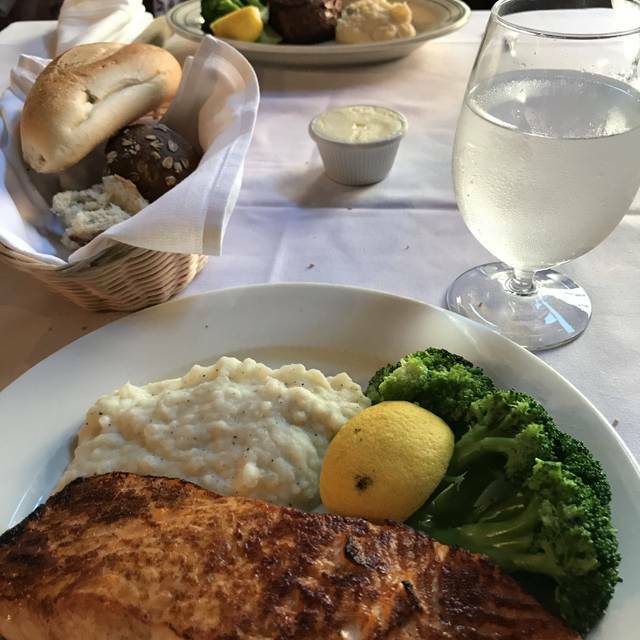 We had their restaurant week special menu, which provided good selections at a reasonable price. Crab cake appetizer was very good, as were their filet and shrimp scampi. This restaurant is equivalent to most other steakhouses in Manhattan, and would definitely consider going back again. Only hitch was that the hostess did not have our Open Table reservation, but we were seated nonetheless as the restaurant was not overly busy. Obviously, they found the reservation after the fact. We went for resturant week and it was a good deal. The clams oreganto, shrimp scampi and filet mignon were really good. I would go back and try something on the full menu. The service was really good, very attentive and nice. My wife and I have dined at Frankie and Johnnie's a number of times - including at their original location. We are big fans of their veal chop, but this time it was not as good as it has been in the past. don't know what the problem was, but we will try again - just to make sure this was not an off night. 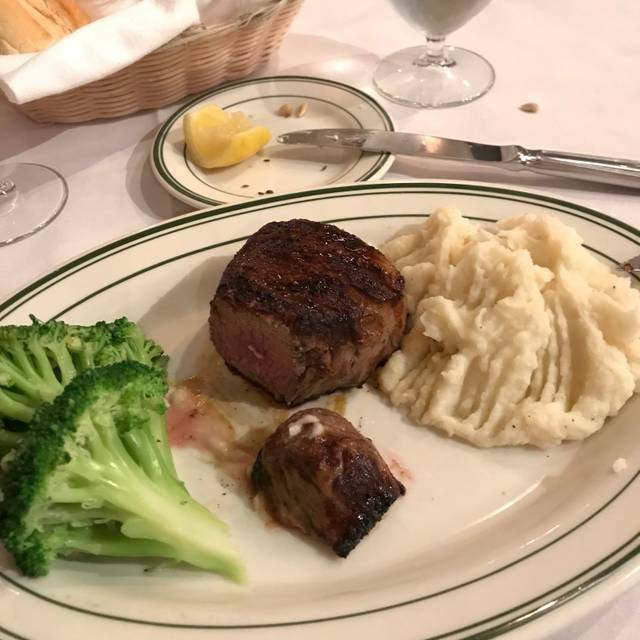 I was visiting New York City to see my son and we decided that a nice steak house would be good place to go before a show. We are not big meat eaters, but a good steak is a nice break. I used OpenTable to find a good, moderately priced ($$) place close to the theatre. The service at Franke and Johnnie's was very poor, mostly slow. My son ordered a medium rare skirt steak and I ordered a medium rare sirloin, along with two sides, garlic mashed potatoes and pan seared brussels sprouts (per the menu). After a long wait two skirt steaks were delivered to my table. I sent the skirt steak asking for the sirloin steak I ordered. A bit of surly reaction by the server, but took the skirt steak back to the kitchen. After about 10 minutes my sirloin arrived. However, it was pretty darn rare. I'm OK with rare, but it wasn't what I ordered and at this point time was becoming an issue. Plus, instead of pan seared brussels sprouts, it was clear that they had been steamed. Oh well. In the final analysis, the service was poor, the steaks were very good, the mashed potatoes were very good and the brussels sprouts were disappointing. Great experience. Very friendly staff! Chicken parmesan was fantastic, penne noodles were great as well. We went here before a show a couple blocks up. Very nice restaurant...requisite white linen tablecloths, etc. Service was terrific. Food was ok, for the price of a high end steakhouse. Steak was well cooked and good, but not the buttery tender I generally expect, and get, from most places like this. Side of brussel sprouts (with the optional garlic and olive oil) was out of this world. Desserts were also very good....cheesecake and. Apple streusel.